What an emotional day. As I made my way toward Mainguard Street, to witness the announcement of the European Capital of Culture for 2020, I began to get a bit nervous. Until then I had been completely confident in Galway’s bid. I mean, how could Galway lose? It is said to be the Capital of the Arts in Ireland and is often referred to as ‘The Graveyard of Ambition’ thanks to its ability to grab passers-by and engross them so completely that they find it impossible to leave. But what if we lost? Regardless of the result, we would have been proud of the work the team had put in and we could be relatively confident that some of the projects being proposed would still be fulfilled. Yet, that would be no consolation to the people who put so much work in to the last year or so. It would be no consolation to the artists who could have experienced, first hand, the effect of being chosen. For all these people, there was a lump forming in my throat. When the result was announced, and Galway was chosen by the judging panel, I found myself welling up at the mass outpouring of pride and celebration throughout the congregation. People of all ages; businessmen, dancers, shopkeepers, butchers, artists, singers, painters, acrobats, actors, everybody was ecstatic that our little city was being acknowledged for the effort that it has always put into culture, and for the effort that could (and, now, would) be put in for the future. To top off a brilliant result, it was time for the first “Big Top” show of the Galway International Arts Festival 2016. 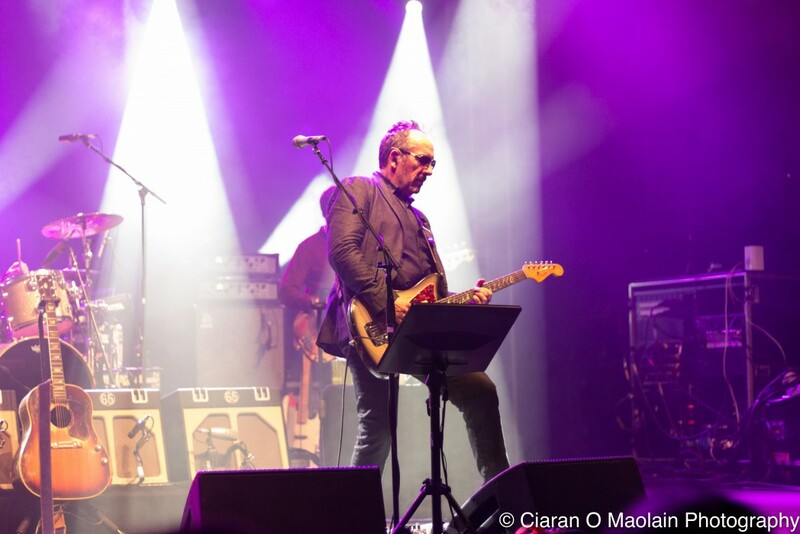 We were being blessed with one of music’s biggest names in renowned songwriter, Elvis Costello. Yet, it was The Undertones that were the more enjoyable. The Derry band were one of the first Irish punk bands to receive acclaim in the UK, Australia, Europe and, to a lesser extent, the United States. We now find ourselves almost 40 years on from the famous day when John Peel of BBC Radio 1 played their breakthrough hit, “Teenage Kicks”, twice in a row on live radio (something he had never done before) but the band still sound as boisterous and raw as ever. In a set of constant belters, “Jimmy, Jimmy”, “Here Comes the Summer” and, of course, “Teenage Kicks” were particularly lively both from The Undertones themselves and the partisan crowd. Billy Doherty was a joy to watch on the drums; never missing a beat despite playing with such speed and aggression. 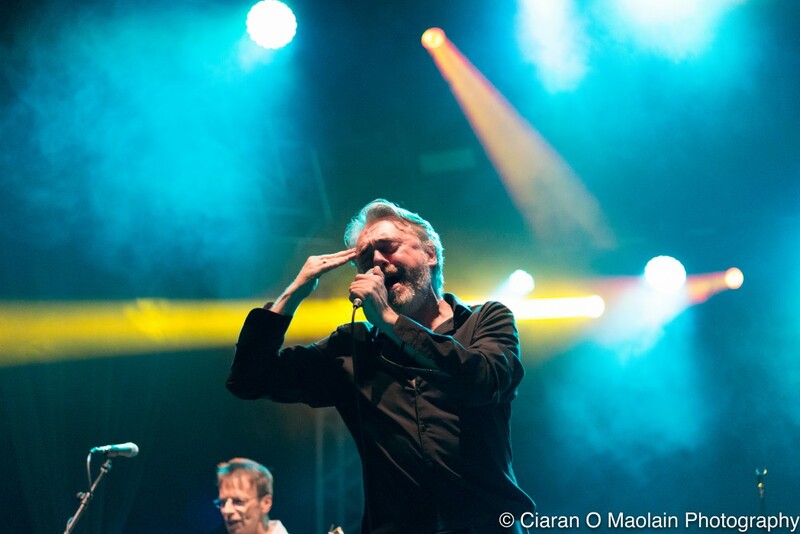 Since The Undertones reformed in 1999 they have been fronted by Paul McLoone, and the Today FM DJ has done a good job of winning over the cult followers of original lead singer Feargal Sharkey. He was passionate and emotional during his performance in the Big Top, equipped with leg kicks and volatile dancing. The backing vocals and harmonies of John O’Neil, Damien O’Neil and Michael Bradley were flawless throughout, despite their years. Costello, on the other hand, seemed like an artist passed his peak. It’s impossible to deny his songwriting ability, evident in songs such as “(What’s So Funny ‘bout) Peace, Love and Understanding” and “Oliver’s Army”; the latter being the most enjoyable song of the show, made even more so by the fact that it is quite often omitted from Costello’s setlists of late. For the majority of the songs his voice was strained and unpleasant. Sometimes it seemed out of tune. His guitar, too, was practically muted and I wondered if this was intentional so as to put more of the spotlight on his fantastic backing band, The Imposters. Steve Nieve, on keys, and Pete Thomas, on drums, were in sync and glued the whole thing together without being overly flashy. That’s not to say Elvis Costello was boring or particularly bad in any way. By the time he got toward the end of his set, he had the crowd firmly on his side and his rendition of “Alison” saw his voice grow stronger and his guitar chime with bluesy attitude. That was, however, about three quarters through his show. The Undertones, in contrast, rifled through four high-octane songs in just 9 minutes to begin their set. The fact that the Irish band stole the show was, perhaps, fitting of the day. It was a proud one for the whole country, not just Galway. The losing candidates will be painfully disappointed; I have no doubt. But that, in itself, is a good thing. To see so many people getting behind their region and being genuinely upset when they lost just shows the kind of support that arts and culture has received for the past year. There was a staggering amount of work put into each of the bids from the final three teams, and of course, Dublin, whom were knocked out earlier in the process. But, thankfully, Galway was chosen to fly the flag for Irish Culture in 2020. Now, more than ever, we can really believe that musicians and artists of all kinds from Galway, and Ireland, are capable of headlining festivals and putting on amazing shows themselves. Now, we need to give them a chance to show what they are worth. Now, we need to start going to shows of local bands who we may have never heard of and going in with an open mind. Now, we need to be proud of the abundance of unbelievably talented artists we have right here in our City and put them on a level playing field with the artists from abroad that seem to hold an allure on the public. Now, we need to support the artists that need it most. It is amazing to see so many Irish artists on the Big Top billing for The Galway International Arts Festival this year; Imelda May, Villagers, Mick Flannery, Bell X1, The Gloaming, to name a few. Over the next four years we need to challenge punters and musicians, alike, to push the boundaries of their tastes and their performances so we can fill that Big Top with Galway musicians in 2020. We can’t rest on our victory, there’s a lot of work ahead. But for now, we should celebrate. As John Peel once famously said: “It doesn’t get much better than this…”. Credit to Ciaran O Maolain Photography for the snaps of the night. I was at the big top that night and I have to say I thought elvis was outstanding . His performance of watching the detectives was just brilliant . From the very start with pump it up the whole tent came to life . Indeed the undertones were also very good but I have to say elvis blew the crowd away . I googled this review to see if anyone else noticed the sound problems. Couldn’t hear his guitar most of the time. For the first two and a bit songs Elvis’ vocals were half a beat out of sync with the rest of the band which was a pity as he started with three ‘crackers’! By the time they sorted it out I thought the damage was done and, while I enjoyed the gig as a whole, most punters after were in agreement that the Undertones won hands down. I have to agree wholeheartedly, I had noticed the vocals being a bit off aswell. It is a pity, because he is such an excellent song-writer but just didn’t seem to be on form on Friday night. It may be harsh to judge one solitary gig, as anything can go wrong on any given night, but that’s my job! haha. Just caught this festival review when it popped up now in my Facebook feed–Many Thanks for your considered views. I put a proposal to the Galway Arts Festival just after Christmas re showcasing five Galway bands in the Big Top on one of the ‘dark’ nights when the venue is all set up with production etc but not in use–I was thinking of the middle Sunday of the festival–a gig starting approx 4pm and running till approx 9pm–I proposed the five Galway Bands– My Fellow Sponges, We Banjo 3, The Whileaways, Tracy Bruen and her band and Amazing Apples. I proposed an early bird ticket of 10 euro followed by advance tickets of 15 euro. I proposed that the Arts Festival make the Big Top available for the ‘Galway’ gig free of charge i.e. everything was already in place- and I would pay for the running costs including security plus the band fees outta gig receipts, sponsorship etc. I guaranteed that the festival would not be out of pocket in relation to the gig running costs and the band fees. I regret to say that the Galway Arts Festival and their Big Top booking partners–The Róisín Dubh–rejected my proposal. I was hoping that the five Galway bands would benefit from the chance to play on the Big Top stage and that the profiles of the various bands would be boosted by their inclusion in the Arts festival programme along with with the bands getting the benefit from all the festivals marketing and promotional resources. I’m the manager of The Saw Doctors for over twenty years and I have considerable experience as a gig promoter. I was also one of the founding members of the Galway Arts Festival back in 1978 and I have produced / curated ten Galway Arts festivals to 1990. Thanks for getting in touch Ollie. That sounded like a fantastic idea for a gig and it is a shame the proposal was rejected. It is an idea that should be further looked into I think, especially now with the recent news and Galway’s achievements, it would be easier to promote and hopefully people would be more willing to attend. I wonder though, if having 5 Galways bands on together would be the most beneficial way of doing it. Playing the stage at The Big Top would be great, but if the room is half-empty it might not be the most encouraging. Perhaps, The Galway bands should be supporting a better known Irish act with more pull, therefore getting their performance seen by more people. It’s certainly an interesting idea, one that should be thought about. I just want to mention I am just all new to blogging and site-building and honestly liked your blog. Likely I’m planning to bookmark your blog post . You amazingly have good stories. Thanks for sharing with us your web-site. Good ¡V I should certainly pronounce, impressed with your web site. I had no trouble navigating through all the tabs as well as related information ended up being truly simple to do to access. I recently found what I hoped for before you know it in the least. Quite unusual. Is likely to appreciate it for those who add forums or something, website theme . a tones way for your customer to communicate. Nice task..
I’m still learning from you, while I’m improving myself. I certainly love reading all that is written on your site.Keep the stories coming. I loved it!